We're delighted to have Amy Lukavics swing by to tell us more about her latest novel, NIGHTINGALE. Amy, what do you hope readers will take away from NIGHTINGALE? I most hope that readers will take away that you don't have to be defined by your trauma. For me personally, I realized there was real strength and power to be found in redefining the narrative around my own trauma, in ways that emphasized a resilience that I may not have been able to appreciate before. That was really the heart of this story for me. It's been a long, hard road for sure, but I've been really fortunate compared to so many other writers. I wrote four books before selling my debut novel, Daughters Unto Devils. Out of the four books I wrote that were never published, I'm interested in revisiting exactly zero of them, haha. They did what they were supposed to do—teach me how to execute plots and develop characters, teach me how to revise properly, and teach me perseverance. I'll always be grateful to them for that. I have never written in public! I really hate the idea of anyone reading over my shoulder, and I feel like a coffee shop might have too many distractions for me. I have my best writing sessions from my home desk, listening to creepy soundtracks on Spotify with headphones. Things that drastically improve the situation but are not required: aromatherapy hand cream for focus and relaxation, lit candles, and, oddly enough...bubble gum. I can't imagine it'd be a pretty thing to witness from the outside, though. I'm sure the smacking and popping sounds from the gum would drive any bystanders mad, but damn if it doesn't improve my focus. Ever since she was little, Amy was especially intrigued by horror books and movies. Raised in Northern Arizona, she sustained herself on a steady diet of Goosebumps, Fear Street, and Scary Stories to Tell in the Dark books before discovering Stephen King in her mother's bookshelf. When Amy isn't reading or writing, she enjoys playing roller derby, cooking, crafting, and playing games across many platforms. Her novel The Ravenous was nominated for a Bram Stoker Award in the Superior Achievement in a YA Novel category, and Daughters unto Devils was a YALSA Quick Picks for Reluctant Young Readers 2017. 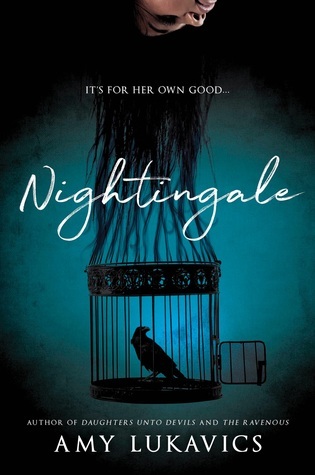 Have you had a chance to read NIGHTINGALE yet? Do you plan to revisit novels you previously wrote that have not been published yet? Have you tried chewing bubble gum for improving your focus? Share your thoughts about the interview in the comments!